We were wondering what was missing from PMA 2008 pre-announcements: Nikon! Here comes the new Nikon D60 , supposedly replaces the well-known Nikon D40X , features 10.2 MP and introduces a new anti-dust system, active d-lighting, a stop-motion recording mode and Expeed branding. Active d-lighting helps in the area where most DSLRs this year will compete on: extended dynamic range. The stop-motion feature - welding together single frames into a movie - is a first-ever feature as far as we know in a DSLR. At least three new lenses: a 16-85mm f/3.5-5.6G ED VR, the Micro Nikkor 60mm f/2.8G ED for die-hard macro enthusiast and the PC-E Nikkor 24mm f/3.5D ED offering both tilt and shift movement. Still have to sort out the number of new Coolpix cameras upcoming; the most prominent may be the P60, a 36-180mm-superzoom compact with optical viewfinder (a rarity) that replaces the Nikon Coolpix P50 losing somehow on the optical side at wide-angle (from 28mm up to 36mm). The P60 features M exposure mode provides full control over both the aperture and shutter speed settings. Check the Coolpix L16/L18 for budget-savy users, the S210 (8 MP), S520 (8 MP) and S550 (10 MP). Updated! Now Nikon D60 is available for pre-order! PMA 2008-driven bargains? Canon Rebel XT with 18-55 is now 23% less. Ok, it may not be due to PMA 2008 and the new Canon Rebel XSI we already wrote about, but now the evergreen Canon Rebel XT 8MP comes in a kit with the standard EF-S 18-55mm f3.5-5.6 Lens for as much as US$ 459.95 - a 23% saving over regular price! PMA 2008: many new products and more trends confirmed! PMA 2008 opens on January 31st: there’s already a host of new products, some of them unofficially introduced, a lot of web speculations and too much rumors. extended dynamic range: in a nutshell the range of luminosity the CCD is able to catch, a much better and technical explanation may be found here on CambridgeInColour.com. Many digital camera are introducing/will introduce algorithms to enhance dynamic range so we’ll have to sort out which just fits better our pictures. - Pentax introduces K200D and Pentax K20D : the first is an entry-level 10 MP DSLR sporting several smart features. - Fujifilm announced many new compact cameras as well as the new S100fs : a high-level bridge camera (bridging compact and DSLR, that is) that takes the place for the (glorious, we still love it) Finepix S9100 (AKA S9600). The 2/3″ CCD reaches now 11 Megapixel, focal length is now 28-400mm (previously the S9100/S9600 lens was 28-300 mm) with optical stabilizer. Yet again the S100fs its own extended dynamic range system (more to investigate on this) and the brand new Film Simulation mode (hence the name FS) already used in the award-winning DSLR S5 Pro. Brand new cameras are the S1000fd, self-dubbed “the smallest 12X zoom compact camera”, and the S8100fd, now with 10 MP sensor, that replaces the (still young) S8000fd. Still many upcoming new products in the next days, both lenses, accessories and memory card. Goin’ to Las Vegas? Check here for more info on PMA 2008. New MacBook Air: the wait is over! The usual frenzy around SF MacWorld finally ended up with the announcement of the MacBook Air . - full wireless (over the Air) connectivity… of course! 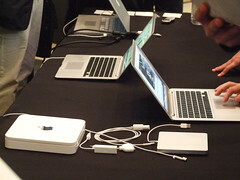 The MacBook Air has no built-in SuperDrive, an external unit, USB-powered, was announced too and will cost US$ 99. Thanks to a new utility called RemoteDisk, running on both PCs and Macs, the DVD unit is almost useless, since you’re enabled to use some other PC/Mac DVD unit remotely. Retail price of the MacBook Air is US$ 1,799 with more options to become available anytime soon. Canon Digital Rebel XTi 10.1MP Digital SLR Camera (aka EOS 400D) is now available (body only) at the bargain price of US$ 529.65, that’s 56% off its list price! One of Canon’s best selling DSLRs ever, right after the hit Rebel XT/EOS 350D. The Canon EOS Digital Rebel XTi digital camera offers an unbeatable combination of performance, ease-of-use and value. This Digital SLR Camera has a newly designed 10.1 MP Canon CMOS sensor plus a host of new features including a 2.5-inch LCD monitor, the exclusive EOS Integrated Cleaning System featuring a Self Cleaning Sensor and Canon’s Picture Style technology, all in a lightweight, ergonomic body. The Digital Rebel XTi is a high performance digital SLR with 10.1 Mega Pixel Canon CMOS sensor and DIGIC II Image processor. Large 2.5-inch LCD monitor with new user interface and wide viewing angle. Fast 3 frames-per-second shooting with 27-frame burst and a 0.2 second startup time. High precision, wide area 9-point autofocus system. Picture Style settings for a broad range of control over color, contrast and sharpening. Print/Share button featuring advanced camera direct capabilities for greater user control while direct printing. EOS Integrated Cleaning System featuring a Self Cleaning Sensor Unit Fully compatible with over 60 EF and EF-S Lenses and a wide range of EOS System accessories. The perfect complement? Canon BG-E3 Battery Grip for EOS Digital Rebel XT Camera ! Now retails U$140.17 (36% saving!) and holds up to two Canon NB-2LHbattery packs or six AA batteries. Please note: currently, this item can be shipped only within the U.S.
Panasonic Lumix DMC-L1 w/Leica Lens with up to 35% saving? The Panasonic Lumix DMC-L1 is a digital SLR compatible with Olympus’ Four Thirds lens mount standard. The L1 is an interesting SLR at that, with a traditional - perhaps retro - styling aesthetic. It is based around the same 7.5 effective megapixel Live MOS image sensor that debuted in Olympus’ EVOLT E-330 digital SLR, along with the mirror box unit from that camera (which combines a quick-return mirror, viewfinder, and AE sensor). Panasonic’s proprietary Venus Engine III LSI handles the image processing, and Olympus’ Supersonic Wave Filter makes its first debut in a non-Olympus branded camera. The Lumix DMC-L1 has a shutter speed dial on the top of the body, while a simultaneously announced Leica 14-50mm lens offers rings to control aperture, focus and lens zoom. As with the EVOLT E-330, the L1 offers a Live View function that allows images to be framed using the LCD display, regardless of whether you’re focusing automatically or manually. In addition, you can use the LCD display as a handy confirmation of focus via an enlarged view when focusing manually. The L1 offers a 2.5″ LCD display with 207,000 pixels, at the high end of what’s available on digital SLRs at the current time. One other feature worthy of note is that the Panasonic DMC-L1 offers a Secure Digital card slot, and is compatible with the FAT32 file system - meaning that Secure Digital cards larger than 2GB are supported. Amazon’s offer slashes by 35% the Lumix L1 its list price, from US$ 1.499 down to $968.96 with a gorgeus Leica 14-50mm Mega O.I.S. Lens ! Wanna save 75% off the list price for the SDI Technologies IH80B Speaker for iPod ? Amazon has in stock these pretty cool speakers for iPod that feature remote control, iPod dock connector, battery or mains operated. Live Life Outloud with this speaker system for your iPod . This contemporary cube design features Reson8 speaker technology for maximum performance that is perfect for both indoor and outdoor use. You are currently browsing the SourceCrowd.com weblog archives for January, 2008.